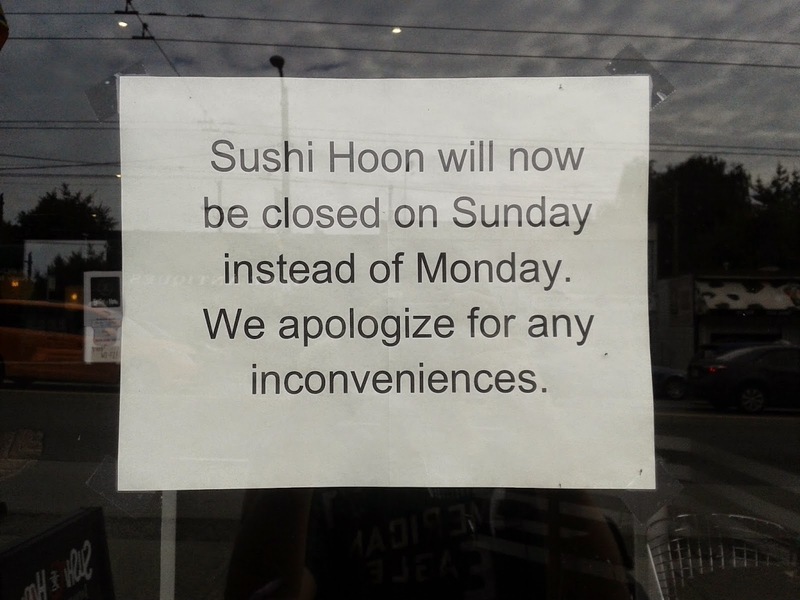 Since I wanted to visit the restaurant on a Monday, this gave me more conveniences than inconveniences. I also submitted an update to Urbanspoon to minimize the inconveniences that may occur to future diners who wish to come on a Sunday. Before the arrival of any of our orders, we received tea, soft drinks, compressed hand towels, and miso soup for each of us, all courtesy of the house. Even the chef came out to greet us at our table. What a friendly start! 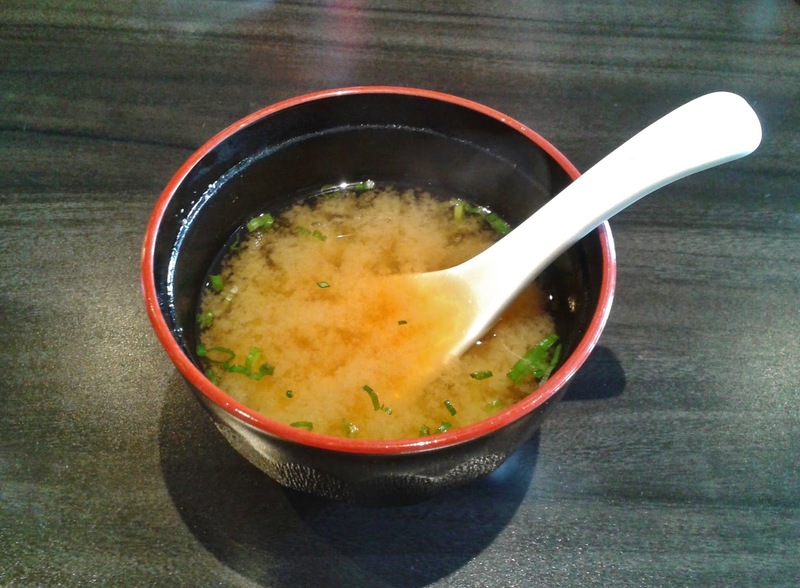 The Miso Soup (complimentary) was served very hot and contained a good amount of green onion and very small blocks of tofu. It was a little watery in flavour and needed a slightly stronger miso paste. The Tuna & Salmon Sashimi came with 3 medium-sized pieces each of salmon and tuna, which were placed on top of some leaves, shredded daikon, and yes, a small pile of ice cubes. Interestingly enough, some of the best sashimi I have had either came with ice or nothing. Freshness was present in both kinds of sashimi here. The tuna sashimi was very soft and melted in my mouth perfectly with a hint of a lemony taste. It had exactly the right amount of saltiness, creating a very delicious, balanced taste. The salmon sashimi needed more flavour, but I liked how it was not stringy at all. 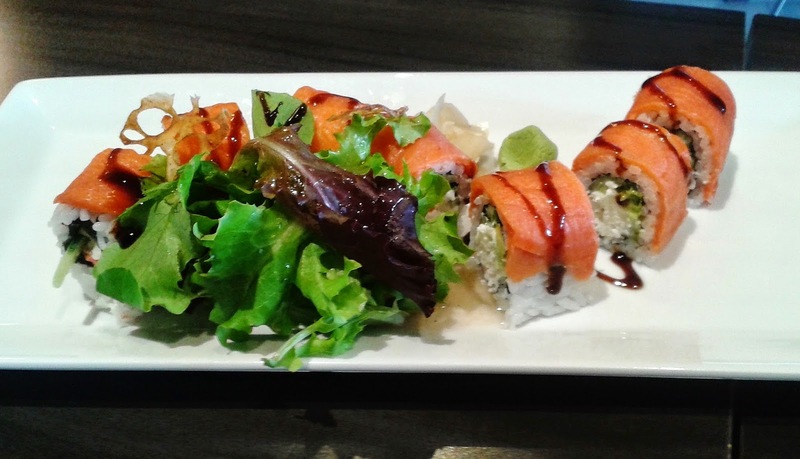 The Alaska Roll consisted of avocado, crab meat, cream cheese and smoked salmon and came with a small green salad. The neatly sliced smoked salmon was accentuated by the teriyaki sauce (which I wish there was more of) and made contact with seasoned rice vinegar, which provided a faint alcoholic taste to the roll. The crab meat inside had a good amount of mayonnaise, but could be even softer. Some of the pieces had an overwhelming percentage of cream cheese, while some had barely any. 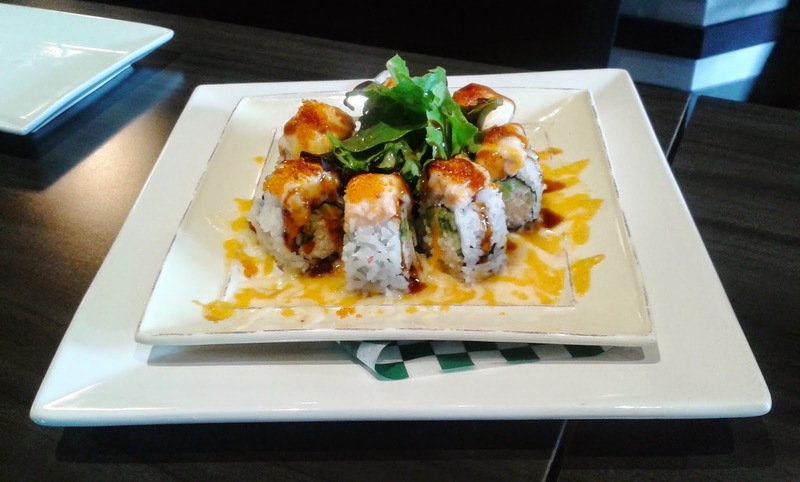 The Lion King Roll was a baked roll containing avocado, cucumber, crab meat, salmon, cheese and tobiko. It appears to me that the cheese represents the mane of the lion, the salmon represents the lion's face, while the salad represents ... perhaps the lion is eating cabbage? The use of a weaker vinegar would help the flavours blend together better. Otherwise, the roll was quite well-balanced as none of the ingredients stole the spotlight from the other ingredients. The baked salmon on top, which was covered with melted cheese, tobiko and teriyaki sauce, was quite savoury. I also enjoyed the salad in the middle, but wished that it had more Japanese salad dressing. The Appetizer Tempura came with 2 prawns, one piece of kabocha (pumpkin) and one piece of yam. I liked the creative presentation, which reminded me of White Spot due to the white and green checkerboard pattern. The prawn was decent and had a soft texture, while the kabocha and yam were sliced too thin (and were consequently obscured by the batter). 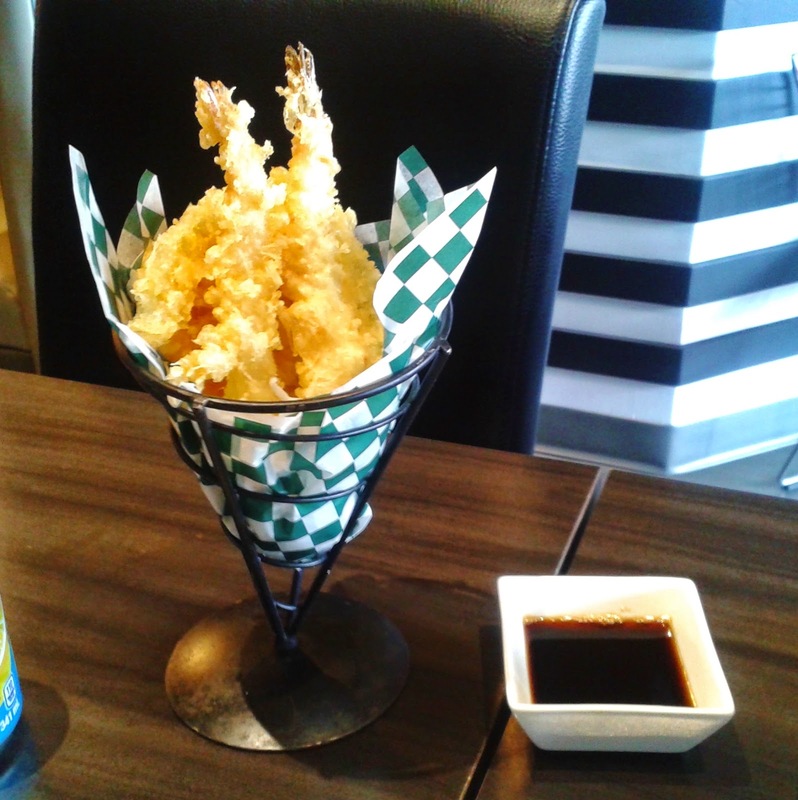 The batter was on the heavier side for all of the pieces of tempura, and the yam tempura had enough batter to cover two similarly sized pieces of yam. Service was very friendly and attentive throughout my meal, and the waitress did her very best to ensure that we would enjoy our experience. 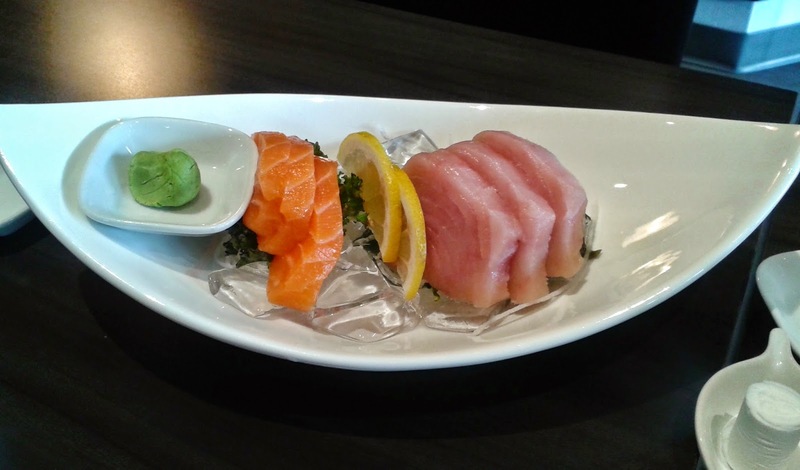 Sashimi and service are clearly their areas of expertise, and their menu contains a good amount of variety. All they need is a creative gimmick to grab the attention of all the potential diners nearby! This one is permanently closed.